Re-reading the original Sherlock Holmes stories. The Stockbroker’s Clerk shows Arthur Conan Doyle mixing things up a little, by tweaking the Holmes formula just enough to keep things interesting. Facts of the case: A stockbroker has been offered what appears to be a dream job, except that his new office is a shambles, and there are two suspicious brothers with matching gold teeth lurking about. 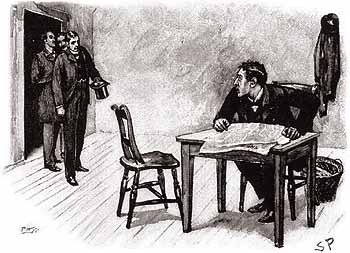 He hires Holmes to figure out what’s going on. 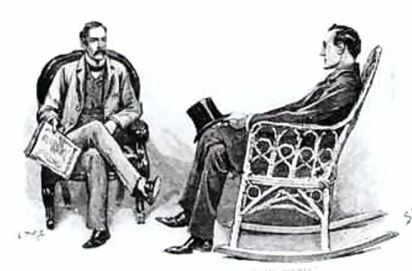 Great detective: Instead of hanging out at Baker Street, this story begins with Holmes visiting Watson at Watson’s home. He relaxes in Watson’s rocking chair (!) and enquires about the well-being of Watson’s wife. Good doctor: We learn Watson has recently purchased a new medical practice from a retiring doctor, and business is booming. He’s been seeing so many patients that he hasn’t visited Holmes in weeks. Action hero: Holmes and Watson go undercover as job applicants. 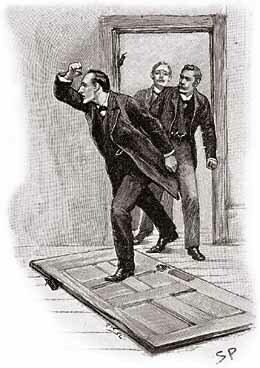 Later, Holmes uses his awesome strength to break down a door to rescue a man on the verge of death. Yes, this is canon: We learn Holmes has a habit of biting his nails. Gross, dude. Indubitably: This one is a lot of fun, and a rarity in that none of it takes place at Baker Street. Then there’s a serious turn when the plot become life and death. The villains’ plot remains somewhat baffling even after two read-throughs, though.